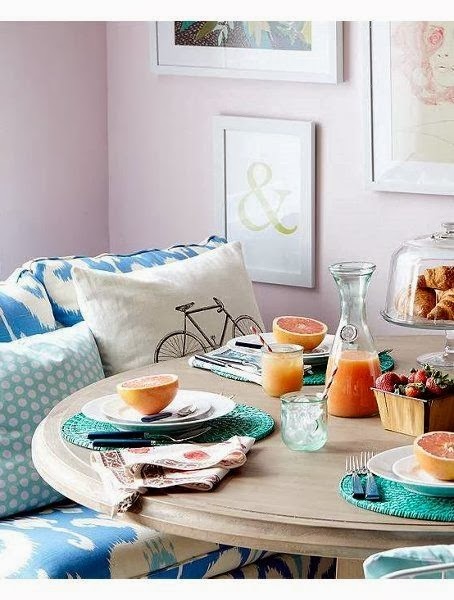 Love this sunny breakfast spot with a cobalt blue sofa paired with light lavender walls...reminds me of my own guest bathroom. I particularly love the idea of dining on a sofa pulled up to a table...lounging with a cup of coffee and a magazine while I munch on my toast...I could get used to that. The bleached wood of this dining table is just beautiful and I love the wee pops of turquoise from the chargers. Such a lovely composition. Hope you have a wonderful, relaxing weekend ahead. Enjoy it...see you next week!